As much as I like Mana`s work and I am really satisfied with all of her great work on Bloodstained, I cannot wait to see what Ayami Kojima has come up with! One of the best things about this game is that my favorite team has come together, Iga, Yamane and Kojima. When the Kickstarter was launched, it was something I had wished for since many years. "Today’s big news is a surprise so late-breaking we’re still pleasantly shocked ourselves. (It all came together last week.) 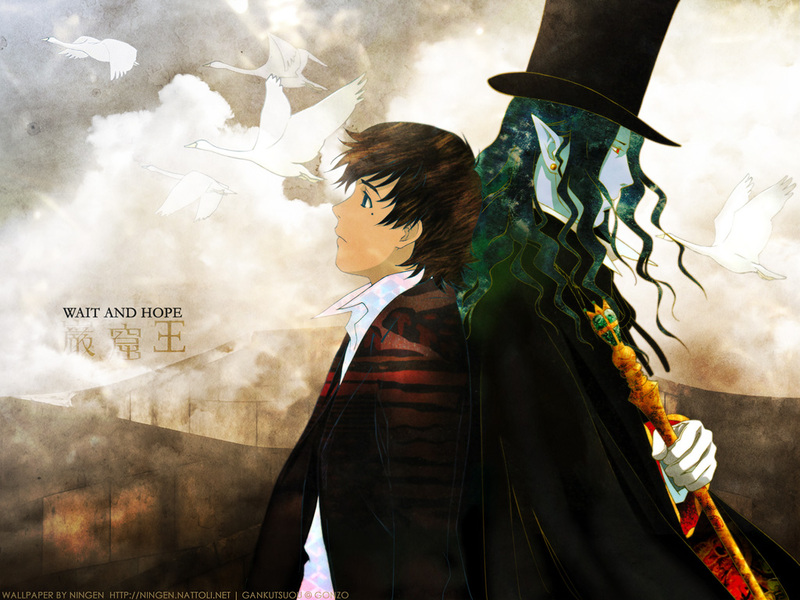 The Alchemist’s Treasure sleeve ($100+ tiers) will feature special cover art by Ayami Kojima." Unless things have changed since that announcement, the slipcase with Ayami Kojima's art on it is for $100+ backers. It seems the slipcase $60+ backers will get is a different, Ayami Kojima-less slipcase. As a $60 backer, I'd definitely be over the moon about a change in those plans, but I haven't heard any news regarding that. Oh, I didn't realize there were other slipcases. 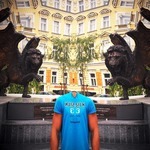 But now I looked back at the site images. Then, might the $60 slipcase be the packaging originally seen on the Kickstarter or the purple one with the gold cross? As per the tiny "*MERCHANDISE MOCKUPS NOT FINAL" tucked away in the corner, I don't necessarily think the final design of the slipcase will actually be of a purple book with a gold cross, but yes, I think that's probably the one they're referring to. - The redesigned town looks gorgeous. Very artistic and moody. Has a clay animation sort of feel to it while still retaining a sense of realism. The windows however (highlighted in blue) look a little too simplistic and unrefined in my opinion, like actual play doh shapes, and would stand to benefit from some additional detailing. Also the area between buildings (highlighted in yellow) could use a little detailing to replace what appears to be an empty and un-textured space. Doesn't have to be anything major, the color looks good as is but the space looks very empty and shapeless. Edit: Not sure if feasible but I think it would be interesting for the lighting on the character models to have a reddish hue to it to further enhance and mirror the atmosphere of the stage itself. Yes, as far as we know, $100 is where the Kojima sleeve comes in, which is a separate thing from a slipcase. $250 box: to complete the matryoshka doll the game is in heh, a big box with a lid rather than an open side like the other two that holds all the things in its tier. I thought on creating a thread for this, but didn't feel that it needed, so i'm going to post this here. 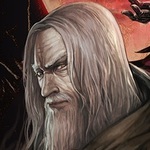 Igavania returns! 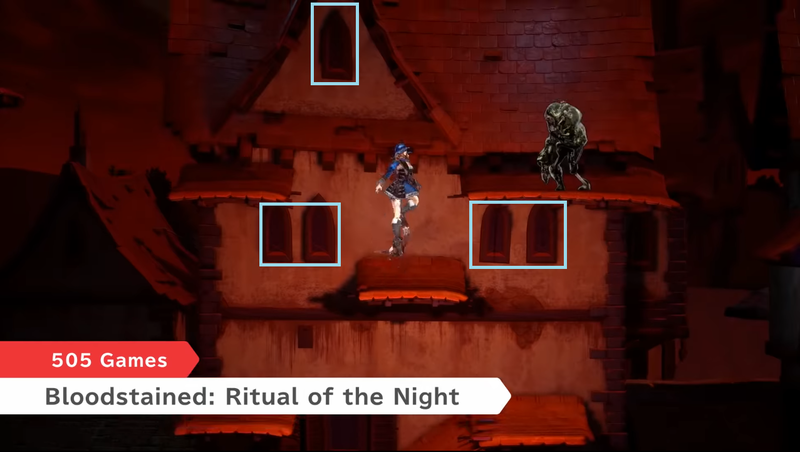 Bloodstained: Ritual of the Night releases this summer. LOTS OF WAYS TO PLAY – With several online and offline modes like Boss Rush, Speed Run, Classic, Nightmare and Roguelike mode, Bloodstained has unparalleled replay value found nowhere else in the genre. Miriam upclose. Nice to see how her overall looks and graphic improved. "Bullwhip" is the actual name of this picture, at 505 games site. We can see a BEAUTIFUL motion while Miriam is using this weapon that looks like a "Sword Whip". The overall scenario is also fantastically crafted, so much it looks like a mock picture and not an actual screenshot of the game. The statues are gorgeous and the architecture is gothic and finely detailed. The window on the background has a huge moon. Garden of Silence's red room redesigned. It looks MUCH better now. Miriam is wearing some kind of Valquirie-like helmet. Weirdly enough, you can see a huge moon in the background and another astro (maybe the sun?) covered by clouds. Zangetsu kneeling down in a place that looks like a forest with a night sky full of stars and towers, most probably from the castle, at the background. This is most probably some kind of cutscene. 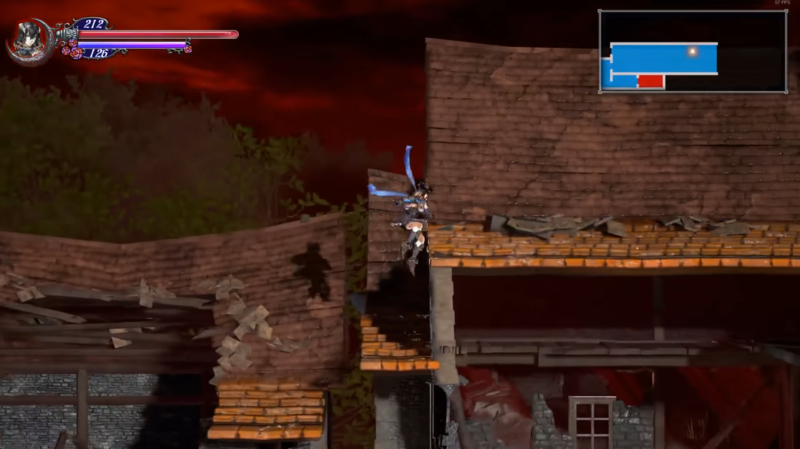 Here, we can see the developer's most beloved area, it seems, the Clock-tower-like area, with an enemy that looks some kind of ghost soldier and backer portraits. That may be just a metaphor, or maybe the game REALLY changes as you play? Maybe the procedural generation has been used for more than just build scenarios? Or you can destroy/change/affect the environment (like what we saw on the videos, with the ghostly carriage). Of course that was given, but they confirmed these modes to exist. That can mean they will also be released alongside the game, and not as a stagger model. Although Ippo Yamada works for Inti Creates and Inti isn't with the dev team since 2017, he is still credited. Maybe what he created is still on the game, or he kept working on it anyways. Also a given, but it is good to know they mentioned that officially. I have always thought that Ippo Yamada would continue to be involved in music composition, since he started in the beginning of Kickstarter campaign. I don/t see a problem that he works for Inti..they did Curse of the moon, no? It is all one big project. I am glad if he composed pieces for Bloodstained. I am mostly excited for Yamane, but it is nice if they share this work so we will have more variety on the soundtrack. The red lighting on Miriam looks beautiful. A more subdued version of that reddish lighting would be great for the village area. CastleDan Personally love the aesthetic of the the shot you posted but not sure if it's a fit for the mood and setting of the stage which looks like an abandoned town. Lighted interiors with open windows would look a little out of place in that specific location in my opinion. Would love to see what the area you posted looks like now though. I do hope they can improve on and add some more detail to the windows though. Probably not a big deal when viewed on the Switch in handheld mode, but it will look very out of place on a PS4 or PC on a 1080p or 4K display. My main concern at this point are assets that clash with the game's more realistic to semi-realistic aethetic by embracing overly simplistic and cartoonish renderings. From what I've observed so far these instances are mainly limited to the areas that were previously shown in the demo but were re-designed following the visual feedback discussion. Would appreciate it if the team would look into this concern for said re-designed areas. As much as I'm a fan of new and re-designed content, if it breaks your immersion with the game, then it detracts more than it adds from the player's experience. The new Saturn segments in SotN are a good example of this as are some of the new 3D effects of the PS4 version of SotN. 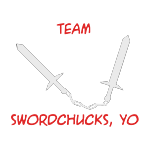 Probably something like what we saw in the video: destroying or moving around 3D assets, affecting gameplay. Doubt they'd need any kind of procedural generation for it, though - just a larger save file! "ORCHESTRAL MUSIC BY INDUSTRY LEGENDS – With music by Michiru Yamane and Ippo Yamada, respectively, veterans of the Castlevania Franchise and Capcom brand, Bloodstained’s music is an unforgettable experience." Either Nintendo is pushing outdated info or he's been working under complete radio silence for the last four years. Well the other possibility is that he had composed some tracks early on in the development. Most if not all of the music updates were posted after Inti had left development to finish CotM(remember that when their departure was announced, they had already been gone a year), so it makes sense that his name wouldn't be tossed around in those updates. But even with that being the case, if he had a role in the music we'll be hearing in the final game, he should get credit for that work. I love the look and re-design of this and would have preferred more of this than less. I understand if someone thinks it clashes a bit with the realistic style but the realistic was very drab and it was the source of a lot of peoples complaints about the visuals. I feel the changes they've made in the vein of the above is why the game has been getting improvement compliments since the trailer. They've put more effort into making the visuals pop more rather than look overly realistic to the point of killing character. Just my take of course. CastleDan I agree completely. The changes they've made will make the game age much more gracefully than if they had stuck with the original style they were working with. But really, it just comes down to people wanting different things from the game, so there was no way everyone was going to be happy. The sky on the image with Zangetsu is nice. I hope that backdrops is in the game somewhere. I always liked both stars on the sky and raindrops on windows. If we're comparing it to the 2017-2018 build of the game I agree that it looks better than that, because although those visuals captured a more realistic look they did so by almost completely abandoning artistic expression. I'm not advocating for how the game looked in 2018. I'm not trying to bash these types of games (or the Bloodstained team for that matter); these are great games that I own and treasure in their own right, but this visual aesthetic is not consistent with what a CV game has looked like or felt like in the past. There's nothing Gothic, mysterious, eerie, or atmospheric about these assets. Of course we all have our own preferences and some people will naturally prefer a more traditional comic-like look to the moody and artistic rendering of reality that has defined the CV franchise. There's nothing wrong with that. We're all unique and have our own preferences. However this project was created and marketed as a tribute to everything that made CV great and that comes with certain shall we say limitations and obligations. Whatever our personal preferences are I think this is something we can all agree on. What I'm arguing for isn't solely my ideal standard either but a compromise that should work for most CV fans based on what previous CV games had to offer. 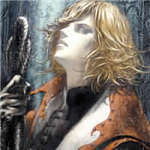 My ideal personal preference would have been a 2D Igavania that looked like a painting of Ayami Kojima's come alive. I understand we're not getting that, and have come to terms with that, but at least let's try to make sure the pendulum doesn't swing too hard in any other direction, whether it be the realistic look that abandons art or the artistic look that abandons realism and atmosphere. Ugh. Lucky. I wish I'd have known about this back when the Kickstarter was still open. dont forget “translator” too. Many times she was Iga’s translator during interviews and panels. She wasn’t hired for that either, from what I can gather. She’s great! That would be actually what she was hired to do, hahaha. Her title was (and still is) Communications Manager, meaning daily translation tasks and communication to and from Iga, in person and in the office. Her role has evolved a lot now, but not officially her title. "Community Manager" is a separate role than "Communications", but also something she filled herself for a while before Angel (who was all along the Brand Manager), and now Question is this, post-Angel as the actual in-title Community Manager. Thanks for the reply. Is Angel still the Bloodstained Brand Manager for 505? I haven’t seen him around here in a while. Is he the one in charge of “Question” too or is that someone else? Aztec yeah Angel is still that role, and still visits and posts here, just not as much as previously, but still quite active in the discord channel. I wouldn't say he's in charge of Question, but they work in tandem. I think the castle size is quite obvious they’re referring as twice the size of the single SotN castle. 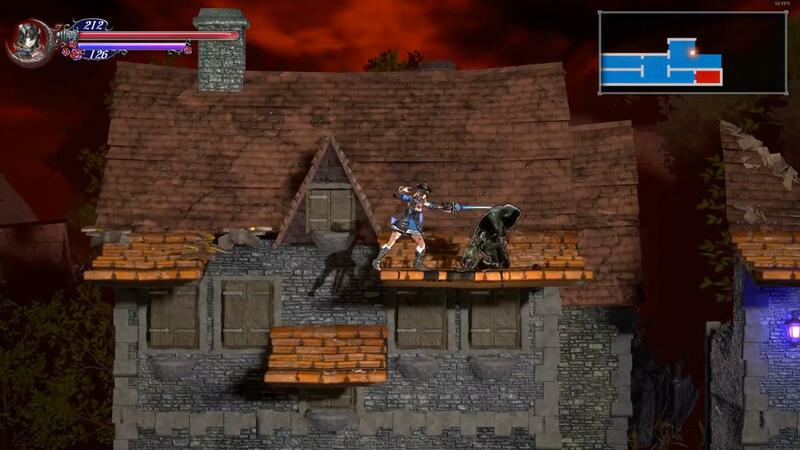 But apparently you’ll be able to invert the castle here too so you can go ahead and multiply the rooms by two for Bloodstained just as you did for SotN. In conclusion: the single castle, not counting inverted, will be almost double in rooms as SotN was. Then multiply both by two for the final room number with the upside down room. 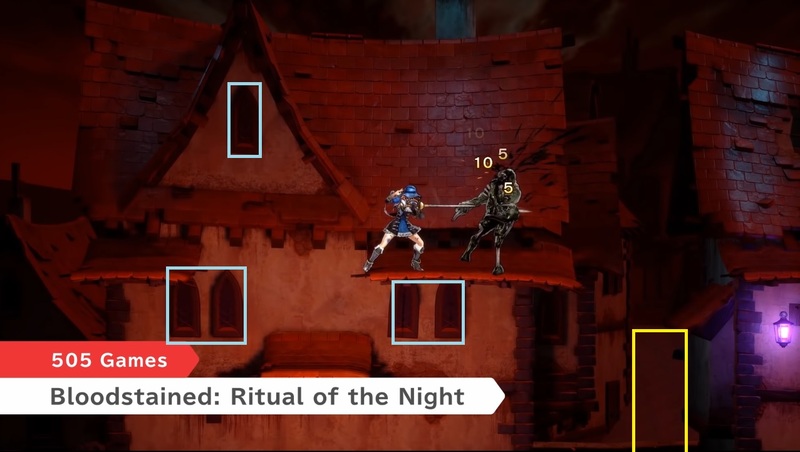 Compared to Hollow Knight does it seem Bloodstained will be bigger or smaller in room numbers for their maps? I haven’t played HK but I keep hearing how big the map is.